The internet contains so much information that I consider it as the new textbook. Almost everyone knows how to use a computer. Millions of people now get their e-mails through their smart phones, i-pads and even some watches when they are away from their computers. Access to the internet is available everywhere you go. Adults use this new textbook to look up weather information, health issues or to stay in touch with their favorite sports team. It has become an integral part of our lives. Retrieving information from the net has become the number one source for information needed for reports and projects for students. Parents are using it to home school their children from kindergarten to twelfth grade. Public schools and even some private schools are now using computers as their source of textbooks so that students don't have to carry home the heavy tomes. Some schools even allow students to "check out" a laptop to take home. As with any tool, when using it the user has a responsibility to know how to use the device and how to take care of it and most importantly the etiquette of using social media. This is called digital citizenship or digital responsibility. There are hundreds of universities and colleges that are offering on-line courses. For students who have a learning disability, college courses at home via the internet can be a saving grace. For students who have a working knowledge of computers and have some marketable skills, many job opportunities await them. Many sites now list job openings for IT personnel. Some of these jobs can be done at home via the computer. I know a home schooling parent's time is limited and the public or private school teacher doesn't have much extra time to spend looking for supplemental materials to use. I also know how frustrated I get when I go to a website because I think I will get some free worksheets or other material. THEN when I get there, I may get one free worksheet and have to sign up for a monthly fee. A few sites may require a minimal fee. These are sites that do have samples that you can look at first before you commit to a financial outlay. Here is a site that will appeal to all mothers, whether you homeschool or not. 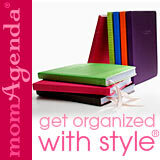 Mom's Agenda is a business that was started by a mom that was busy and needed a way to keep dates organized as well as her LIFE. This is not an agenda (schedule) made by someone sitting behind a desk but by someone who had a busy lifestyle and found a way to get it together. I hope these beautiful agendas, daytimers and calendars find a way into your home and life! You will find a list of recommended websites on the educational websites page. BEWARE of bogus websites or link farms. These are sites that rate high on the search pages, but offer nothing. For instance, you might see Educational Directory. Thinking this is a great site, you go to it only to find it has thousands of other sites to go to. You have to filter through these to find the ones you want. Also, be aware of legitimate websites versus phishing websites. Phishing is an attempt by cyber-criminals to get sensitive information such as financial and banking status. They usually use e-mails as the initial contact. It is important for you and your family to be able to recognize these attempts. Take this 3 minute quiz to find out how much you know about legitimate sites. Make sure anyone in your family that uses the computer takes this quiz. Go to Open DNS. As I find good web sites, I will add them to the list. Please let me know if you find a website I should include on this list. I will check it out. If it fits my criteria, I will add it so that others might benefit from it. Just use the form below to contact me.